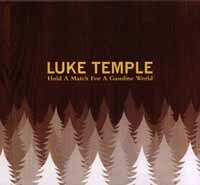 Listen to the new LP by Luke Temple, Hold a Match for a Gasoline World, and you'll be hard-pressed to put your finger on any one specific sound or style. The opening track, "Someone, Somewhere," twirls like a Ferris wheel ride thanks to its quick backbeat-chop acoustic guitar, tooting clarinet and brush-rhythms -- it's as rambunctious as a roomful of kittens playing with a yarn ball. Electric-guitar-fueled slow-beat rockers like "In the End" and the trippy "Radiation Blues" pound with a determined, laid-back assurance. Then there's "To All My Good Friends, Goodbye," a pedal-steel powered twanger, and "Mr. Disgrace," a gentle acoustic lullaby accented by subtle woodwinds. The CD's diversity comes from selecting among tunes written over a five-year period, Temple said via cell phone while driving along a rainy Interstate 5 between Seattle and Portland. "I'm trying to narrow my sound a bit," he said. "My emotions ping-pong all over the place and I always end up being in a totally different space. It's hard for me to have a conscious idea of any one style; I like so many different kinds of music." 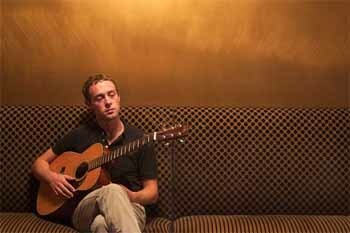 The common thread that runs through Temple's mostly acoustic music is his lonely high-octave voice. Not a falsetto, his breathy voice has a pitch and delivery that falls somewhere in a territory bordered by Elliott Smith and The Flaming Lips' Wayne Coyne. It's a quiet, almost restrained tone from a singer/songwriter who, at age 30, is coming to the rock-n-roll party a little later than usual. Born in Salem, Mass., Temple has bounced between the east and west coasts his whole life, moving from Mendocino to Boston to study for five years at the School of the Museum of Fine Arts. Then it was off to New York City. "I had a trajectory to become a painter and show my work there," he said. "I didn't take music seriously until I was 25 or 26, though I'd already been playing around town for years." Eventually some of Temple's recordings made it to Seattle and tiny Mill Pond Records. The label wanted to sign him, but despite eking out a living doing menial chores like house painting and parking cars, Temple was reticent about leaving the Big Apple. When his girlfriend was offered a spot at a Seattle dance company, Temple moved with her and signed a contract. "It's been the best move I've made so far in my career," he said, adding that it was time to get out of NYC. "Seattle is the antidote for New York, just like New York is the antidote for Seattle. The scene there is pretty rock and roll. It's not like my music isn't a natural sound for Seattle, but they've been really welcoming. Everyone knows each other and hangs out, from top tier to lowest tier. It doesn't seem as exclusive as New York." With his debut full-length slated for release April 19, Temple is hitting the road for the first time in his life, traveling with his pals from New York band The End of the World, who not only share the double bill (and the van), but also play alongside Temple on a few numbers. As any first-time touring act would expect, the draw to his shows so far has been somewhat limited, ranging from as few as three people at one gig to a full house in Austin, where he played as part of the South by Southwest festival. Is performing to a small crowd discouraging? "Honestly, it's not," Temple said. "I've learned playing all these shows that if only two people are there, it's better than nobody. Our record isn't even out yet. People will start coming out for us eventually; I'm not concerned about it. We just keep getting better as a band, and the rest will work itself out." Published in The Omaha Reader March 30, 2005. Copyright � 2006 Tim McMahan. All rights reserved. "Seattle is the antidote for New York, just like New York is the antidote for Seattle."